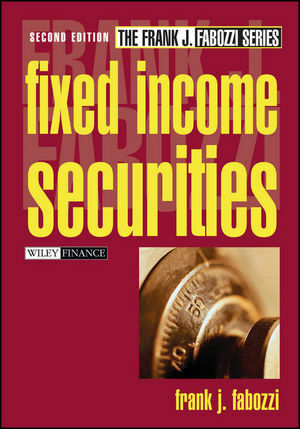 Fixed Income Securities, Second Edition sets the standard for a concise, complete explanation of the dynamics and opportunities inherent in today's fixed income marketplace. Frank Fabozzi combines all the various aspects of the fixed income market, including valuation, the interest rates of risk measurement, portfolio factors, and qualities of individual sectors, into an all-inclusive text with one cohesive voice. For the financial professional who needs to understand the fundamental and unique characteristics of fixed income securities, Fixed Income Securities, Second Edition offers the most up-to-date facts and formulas needed to navigate today's fast-changing financial markets. Increase your knowledge of this market and enhance your financial performance over the long-term with Fixed Income Securities, Second Edition. Features and Risks of Fixed Income Securities. Valuation of Fixed Income Securities and the Measurement of Interest Rate Risk. Yield and Yield Spread Measures. Collateralized Borrowing and Securities Lending. Introduction to Fixed Income Portfolio Management. Overview of Fixed Income Portfolio Strategies.